VYXEOS is indicated for the treatment of adults with newly-diagnosed therapy-related AML or AML with myelodysplasia-related changes. VYXEOS has different dosage recommendations than other daunorubicin and cytarabine-containing products. Do not interchange with products containing these ingredients. Do not use in patients with a history of serious hypersensitivity reactions to cytarabine, daunorubicin or any other components of VYXEOS. This segment is presented Sara Tinsley, a nurse practitioner from the H. Lee Moffitt Cancer Center and Research Institute in Tampa, Florida. 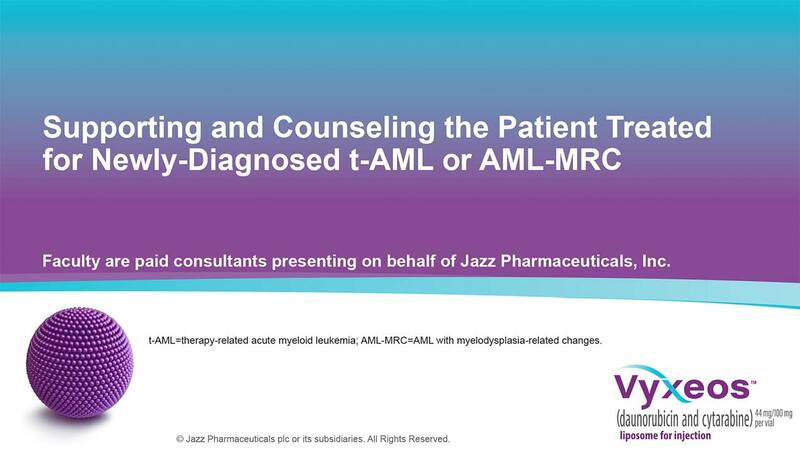 She will discuss counseling and support for patients with t-AML, therapy-related acute myeloid leukemia or AML-MRC, acute myeloid leukemia with myelodysplasia-related changes. So now, let's talk about looking at managing the complications, and the patient counseling and support. …the front line taking care of these patients. And during the supportive phase, we monitor for neutropenic fever, for hematologic complications, the bleeding and the infection that we were talking about, gastrointestinal complications, and if our patients stop eating we get Dietary involved and nutrition supports ... consults. …and you might not have the staff to take care of them in an outpatient setting. So, you want to look at the overall condition of the patient; look at the patient first, their comorbidities; look at their social support; the caregiver; the whole team. How close they are to the treatment center -- if they live 2 or 3 hours away, then that might not work when you're trying to give this unless you have a local ... Sometimes we've given it outpatient, and then been in really good communication with the referring provider to help guide them as to how frequently they need to be checked, and what to look for. …new rashes. And we all know the risk to reduce infection is good hand-washing; avoiding contact with sick individuals. …and we're their cheerleaders as far as they're not going to be neutropenic forever hopefully, and they can get back to their friends and doing FaceTime with their friends, and other ways to still stay connected. For foods, we encourage them to have their meat and eggs well-cooked; and of course, good oral hygiene. And I always go over before a patient begins the chemotherapy, that they know the contact numbers to call, and I also let them know ... encourage them that even in the middle of the night there's someone on call, and that it can be life or death if they sit on an infection. Serious or fatal hemorrhage including CNS hemorrhage have occurred with VYXEOS. Monitor blood counts regularly and provide platelet transfusions as needed. Due to the risk of cardiotoxicity, VYXEOS is not recommended in patients with impaired cardiac function. Discontinue in patients with impaired cardiac function unless the benefit of treatment outweighs the risk. Calculate the lifetime cumulative anthracycline exposure prior to each cycle of VYXEOS. Discontinue in patients with severe or life-threatening hypersensitivity reactions, treat the signs and symptoms and monitor until resolution. Use only if the benefit outweighs the risks in patients with Wilson’s disease or other copper-related metabolic disorders. Discontinue in patients who develop acute copper toxicity. Administer by the intravenous route only. Advise females and males of the potential for VYXEOS to cause fetal harm and to use effective contraception. The most common adverse reactions include hemorrhagic events, febrile neutropenia, rash, edema, nausea, mucositis, diarrhea, constipation, musculoskeletal pain, fatigue, abdominal pain, dyspnea, headache, cough, decreased appetite, arrhythmia, pneumonia, bacteremia, chills, sleep disorders, and vomiting. AML=acute myeloid leukemia; AML-MRC=AML with myelodysplasia-related changes; t-AML=therapy-related AML.